Fantastic! Thanks for a great article. I have a x220 and was looking to do exactly the same thing. So, aside from the USB 3.0 port which I can live without on Mac OS, have you found everything is working ok? Is it stable? Don’t suppose you’ve tried installing anything intense on it to see if it responds well? If going dual boot I’m thinking I might need to upgrade my hard drive. Was looking at one of those momentus xt drives from Seagate. How much space did you take up for the basic OS installations? The main issue is that the wifi won’t work unless you swap out the wifi card, or get a USB one. Everything else works 100%. I’ve installed Steam, with Portal 2 on it. Works 100%, same as in Windows. The Momentus drive works great, but it’s a very tight fit physically. I used about 550 GB for the OS’s, but I wanted a lot of space on the Windows 8 partition for Steam (200GB), and I needed to have 160GB for the Windows 7 Partition. If you’re just using Win 7 / Mac OS with fresh installs, then I’d suggest about 80GB for each, then have a third partition formatted FAT, which is then accessible as storage by both. If you get stuck at all, let me know. I should be able to help you out. 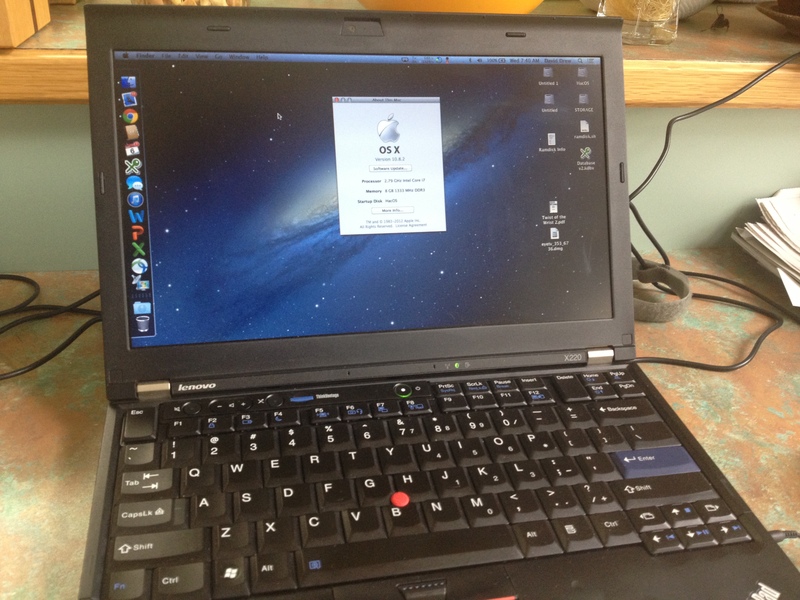 I have had my X220 running on Mac for more than a year now. I am running 10.8.5 with everything working, USB, WIFI, BLUETOOTH, camera, mic, HDMI, lcd brightness (that was a hard one), sound ETC. ETC. 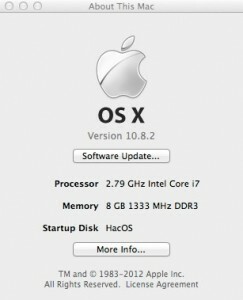 I came from snow leopard, lion, mountain lion and now I’m waiting for mavericks to show up. The usb, it must be the left one closer to the LCD, and that is because it is USB3.0 , you can get it to work by installing a patch 3.0 Mac driver.